This week was women's college week at Simmons. I'm not in any way associated with admissions, but if there was ever a week they should have been promoting the college it would be this one. Early in the week we had panels talking about everything from transgender issues on campus to women in science and math fields, but the important thing was that yesterday we had Gloria Steinem speaking on campus. The Class of 2013 brought her hear to enlighten us on things. If you don't know who she is Google that and come back. There are only a handful of people in the world that I would have been more interested in seeing speak. She was brilliant. I laughed a lot. I cried once. I really felt empowered to change the world. I recognize I've been brainwashed into this reaction, by nature of being at this school, but it was still an authentic reaction. If this were before college I would have thought it was a decent speech, but not totally been on board with the message. 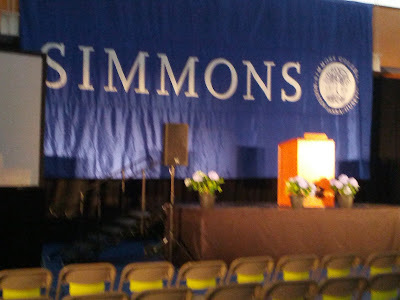 Going to Simmons is a really unique experience that has revolutionized my worldview. It's this strange corner of the world that is hard to capture. Why? It's a Women's College. That's not something I would give up or lobby to overturn, but it is rare and I dreaded it when I sent in my acceptance. This place preaches equality, inclusion, and diversity so relentlessly that whether you like the message when you enter or not, by the time you leave you are either a feminist or you hate the place. I would have been intrigued with Steinem's ideas at any time, but I have grown much more radical since I've gotten to college. It's hard for me to dislike anyone that says, "Tell stories. Real stories of real women and girls... Every issue that I know about came up by someone telling the stories of their lives.We need individual stories," because what am I doing on this blog if not telling the stories that matter to me? The other moment that would enrapture and endear any English major was when Gloria said, "I love to think about words, don't you love to think about words?" I wanted to scream out. Yes. I love words so vehemently I can have half-hour long debates about the accent in the word hegemony (is it iambic pentameter or not?). I love words so passionately that I can't go a day without writing some special ones down. 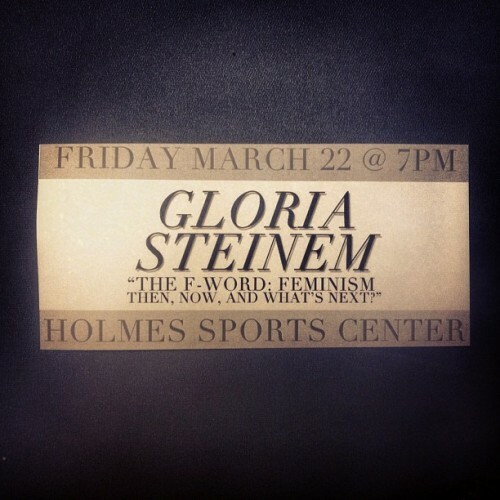 Gloria Steinem, let me tell you, is good at words. The moment that made me cry during her beautifully said speech was when a young lady of indeterminate single-digit age asked what little girls like her could do to make big change like Gloria did. Steinem said that the child should continue to speak up and always remember to say, "That's not fair and you're not the boss of me." That's just good advice. Children struggle with autonomy the most out of any group (I admit I've said "because I said so" to a child) and almost everyone can think of an instance where they were oppressed. 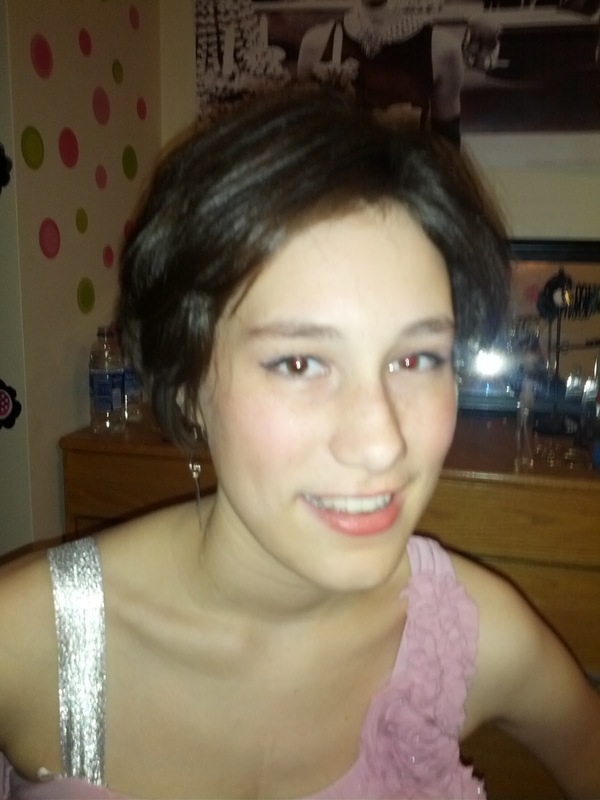 I'm a disabled young woman. I'm audacious and brave, but it never hurts to be reminded that I am allowed to ask for a level playing field. I can demand things be accessible. I know that, "the power of the state stops at our skins," but when I am laying in a hospital bed, powerless, sometimes I forget. Doctors shouldn't be allowed to do things to me that I don't want done (which has happened) and I am in charge of this heart and this body now that it's been given to me. I've always had a good life, but things have improved markedly since I've come to college. In high school I lived on the outside. I was weird. I was the kid that disappeared I was the sick one that everybody stayed six feet away from. Many teachers were great, but even the club I was the head of I wasn't the star member. I can't explain why, but I felt like a stranger to the kids my age. At Simmons, I'm one of the leaders that people just know. Gloria said that, "people who live in the periphery need the experience of being at the center" and I have that in Boston. Right now professors, classmates, and friends all know who I am and recognize that I have valuable contributions to the world. I am no longer afraid to be noticed like I was in high school. At a women's college there isn't competition to be noticed or do better. There is, instead, cooperation to make sure everybody who wants to do something has a chance. Outside, in high school and all the other corners of my life it's terrifying to be intelligent and successful. You have to worry about what people will think. "Only with women would success be an impediment to being liked," but it is. I struggle enough within myself about deserving what I have; sometimes it's difficult to also shoulder the expectations of others. I do well, though. I'm not overwhelmed. I'm thriving. This is the perfect place to feel empowered. Here, we are realistic about what women are because almost everybody is a female. There aren't many men around to put us on a pedestal or limit our options. I don't hate or dislike males. I love them. I need them. They are different, though. "A pedestal is as much a prison as any other small space," but there are none around here. If we choose to be part of all the clubs then we have made a choice for ourselves, not because of any outside influence. We have to do all the jobs ourselves from Technology desk help to President of the Student Government. That's empowering. Sometimes I miss seeing men and the element they bring, but I'm always glad that there are realistic expectations of me here. Nobody thinks I can do everything. We all know that, "if you have to do it all, you can’t have it all." We are students first. We are friends second. We run the school third. One event at a time we build a community that shows us how to take care of each other. Some schools wear down their students, but Simmons doesn't. I have meditated in class before. It's not kind all the time, but it encourages us to be a community of individuals that put our own long-term success first. Gloria and this whole school encourages us to understand how to respect the time we exist within so we can make the future better. "Living in the present is the only time we can be truly alive" and Simmons is alive. Yesterday an awesome lady gave an awesome speech. Underneath everything Gloria Steinem and I have the same goals. Sure, she's a celebrity that you can Google and I'm just a college student with a blog, but who doesn't "want to be remembered as someone who did her best to leave the world a little better, more connected, and whole." While we were waiting in line I turned to my friend and said, "Someday I am going to do something amazing and five hundred people will line up to hear me speak." I've had practice with my Make-a-Wish talks so I know the public speaking isn't the barrier, only the 'something amazing' is standing in my way. Maybe that something will happen. Maybe it won't. If there ever was a place where I could learn to be a successful woman it feels like Simmons to me.